Boutros Boutros-Ghali (Arabic: بطرس بطرس غالي) (November 14, 1922 - February 16, 2016) was an Egyptian diplomat who was the sixth secretary-general of the United Nations from January 1992 to December 1996. He presided over the UN during a time of marked change in the world, as well as some of the most brutal conflicts of modern times. Boutros-Ghali was a thoughtful and independent leader who was criticized for not responding quickly enough in the face of tragedies like the genocide in Rwanda, although other critics lay the blame on members of the UN, not on their servant who by himself can take very limited initiative. He also stirred up controversy, particularly with the U.S. administration for his refusal to bow to pressure to conform to the U.S. agenda, which may have cost him a second term. He is the only U.N. secretary-general to serve only one term. He was appointed head of Egypt's human rights commission in 2003, established in response to complaints from Egypt's minority Coptic Christian community, to which the former secretary-general belongs. Boutros Boutros-Ghali was born in Cairo, Egypt into a well-regarded Coptic Christian family. "Boutros" is Arabic for "Peter." His great grandfather was a courtier in Coptic Christian society, responsible for managing the massive holdings of a royal prince in a nineteenth-century caliphate. The Boutros-Ghali family has other prominent members in Egypt: prime minister Boutros Ghali (1846–1910); Waghuih Ghali, the Egyptian writer, is Boutros' brother. He married Leia Maria Boutros-Ghali, née Leia Nadler, who was raised in an Egyptian Jewish family in Alexandria and converted to Roman Catholicism as a young woman. Boutros-Ghali died aged 93 in a hospital in Cairo, after having been admitted for a broken pelvis or leg, on February 16, 2016. Boutros-Ghali graduated from Cairo University in 1946. He earned a doctorate in international law from the Sorbonne as well as a diploma in international relations from the Institut d'Etudes Politiques de Paris (best known simply as Sciences Po) in 1949. His doctoral thesis was a study of regional organizations. The anti-colonialist views of Boutros-Ghali were already well formed by the time he was a college student. He also described himself as active in his opposition of Muslim fundamentalism by the time he moved to Paris in 1946. He was appointed professor of international law and international relations at Cairo University following completion of his doctorate. He held this position until 1977. He was a Fulbright research scholar at Columbia University from 1954 to 1955, director of the Centre of Research of The Hague Academy of International Law from 1963 to 1964, and visiting professor on the faculty of law at Paris University from 1967 to 1968. He became president of the Centre of Political and Strategic Studies in 1975 and president of the African Society of Political Studies in 1980. By the time Boutros-Ghali entered government service, he had enjoyed a career in academics spanning nearly twenty years. He lectured at universities in all corners of the globe on international law and international relations. In addition to teaching, he has published numerous articles and books, on the subjects of regional and international affairs, law and diplomacy, political science and Islam thought. Boutros-Ghali served as Egypt's minister of state for foreign affairs from 1977 until early 1991. In this position, he played a part in the peace agreements between Egyptian president Anwar Sadat and Israeli prime minister Menachem Begin. Boutros-Ghali participated in the Camp David Summit Conference in September of 1978 leading up to the Camp David Accords between Egypt and Israel which were signed in 1979. Over the two decades as an academic and an additional two decades in government, Boutros-Ghali was called upon to participate in many conferences to discuss international law, human rights, economic and social development, decolonization, minorities, cooperation between African and Arab nations and more. During his tenure as minister of state for foreign affairs, Boutros-Ghali led Egyptian delegations to meetings of the Organization of African Unity (OAU), the Movement of Non-Aligned Countries and the Summit Conference of the French and African Heads of State. He led Egypt's delegation to the General Assembly in 1979, 1982 and 1990. Boutros-Ghali was appointed deputy minister for foreign affairs in May of 1991 and served for several months before his appointment as secretary-general of the UN in December 1991. Boutros-Ghali began his term in the top post of the United Nations in January 1992. He was a strong supporter of the UN mediating in the post-Cold War discord. During his tenure, there were long and challenging peacekeeping missions in Bosnia and Herzegovina, Somalia and Rwanda. Criticism landed on Boutros-Ghali for the UN's failure to act during the 1994 genocide in Rwanda, which officially left about 937,000 people dead. He appeared unable to muster support in the UN for intervention in the continuing civil war in Angola. In reality, the nature of conflicts in the world was shifting—many more conflicts were taking place within states rather than between them. The level of brutality against civilians in some of these conflicts was unimaginable. One of the hardest tasks for his office during his term was providing the UN diplomatic and humanitarian work to resolve the crisis during the wars in countries created after disintegration of former Yugoslavia. HIV/AIDS surfaced as a pressing interstate problem as well during Boutros-Ghali's term as secretary-general. On the positive side, South Africa held its first non-racial elections in 1994. Voting was peaceful and successful. His reputation became entangled in the larger controversies over the effectiveness of the UN and the role of the United States in the UN. For his detractors, he came to symbolize the UN's alleged inaction or inadequate action in the face of humanitarian crises. His defenders accuse the U.S. of blocking UN action and playing politics when the secretary-general maintained views and positions independent of the desires of the U.S. administration at the time. In fact, Boutros-Ghali speculated that the pending U.S. presidential elections and the sparring between candidate Bob Dole and incumbent Bill Clinton played a role in how his leadership was portrayed in the media as he approached the conclusion of his first term. Boutros-Ghali lamented, "It would be some time before I fully realized that the United States sees little need for diplomacy. Power is enough. Only the weak rely on diplomacy ... The Roman Empire had no need for diplomacy. Nor does the United States." Boutros-Ghali was originally appointed, there were concerns expressed by some nations about his age; he was 70 years old at the time. His response to this was that he would not seek a second term. As the end of his first term neared, he expressed a desire to continue on as secretary-general and serve a second term. In 1996, ten Security Council members, led by three African members (Egypt, Guinea-Bissau and Botswana) sponsored a resolution backing Boutros-Ghali for a second five-year term, until the year 2001. However, the United States vetoed a second term for Boutros-Ghali. In addition to the United States, the United Kingdom, Poland, South Korea, and Italy did not sponsor this resolution, although all four of those nations voted in support of Boutros-Ghali (after the U.S. had firmly declared its intention to veto). Boutros-Ghali was the first and only UN secretary-general not to be elected to a second term in office. Boutros-Ghali was succeeded as secretary-general of the UN by Kofi Annan. 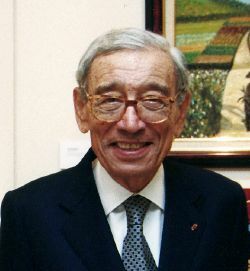 From 1997 to 2002 Boutros-Ghali was secretary-general of La Francophonie, an organization of French-speaking nations. From 2003 to 2006, he served as the chairman of the board of the South Centre, an intergovernmental research organization of developing countries. He served as president of the Curatorium Administrative Council at the Hague Academy of International Law. In a September 2004 interview on Egyptian television, Boutros-Ghali called the United States a "totalitarian regime" in its dealings with the rest of the world, according to a translation provided by the Middle East Media Research Institute. Boutros-Ghali supported the Campaign for the Establishment of a United Nations Parliamentary Assembly and was one of the initial signatories of the Campaign's appeal in 2007. In a message to the Campaign, he stressed the necessity to establish democratic participation of citizens at the global level. From 2009-2015 he also participated as jury member for the Conflict Prevention Prize, awarded every year by the Fondation Chirac. Boutros-Ghali was honored by two dozen nations over his career. He was decorated with the Sovereign Military Order of Malta. The World Affairs Council of Boston awarded him the Christian A. Herter Memorial Award in March 1993. The Italy-based Together for Peace Foundation bestowed the "Man of Peace" award on Boutros-Ghali in July 1993. He received the Arthur A. Houghton Jr. Star Crystal Award for Excellence from the African-American Institute in New York in November 1993. In addition, he was awarded countless honorary degrees and appointments from universities around the world. ↑ Resources on Kosovo War: ZNet's Original Essays and Selected Links Regarding the NATO Bombings. ZNet. Retrieved July 3, 2007. ↑ South Centre. Retrieved July 3, 2007. ↑ Middle East Media Research Group, TV Monitor Project. Former UN Secretary General Boutros Ghali: US is not a Democracy When it Comes to the Outside World. Retrieved July 3, 2007. Williams, Ian (reviewer). "Bhoutros Ghali Bites Back." The Nation (June 14, 1999). Review of Bhoutros-Ghali's book, Unvanquished, available through Global Policy Forum. This page was last modified on 19 March 2016, at 18:00.